Ever since last Friday people have been sending me links to Dr. Paul Williams’ story about the headquarters of the Muslims of America and Jamaat ul-Fuqra near Hancock, NY. I haven’t written about it until now for three reasons: 1) I’ve been too busy with my real job; 2) I have a mile-long backup of blog posts waiting to come out; and 3) There was no new information in the story. Nonetheless, Dr. Williams’ story is a good summary of the available material on Islamberg. For more information on Jamaat ul-Fuqra look on our left sidebar and follow the links there, or visit The Politics of CP, which has the most exhaustive store of information on JF available on the internet. Additional hamaats have been established in Hyattsville, Maryland; Red House, Virginia; Falls Church, Virginia; Macon, Georgia; York, South Carolina; Dover, Tennessee; Buena Vista, Colorado; Talihina, Oklahoma; Tulare Country, California; Commerce, California; and Onalaska, Washington. Others are being built, including an expansive facility in Sherman, Pennsylvania. CP, the Christian Action Network, and I have reported on a Jamaat ul-Fuqra compound near Commerce, Georgia. But a quick search of the internet reveals no reference to JF and Commerce, California, other than Dr. Williams’ own report and other posts based on it. I think this may be a error on his part. 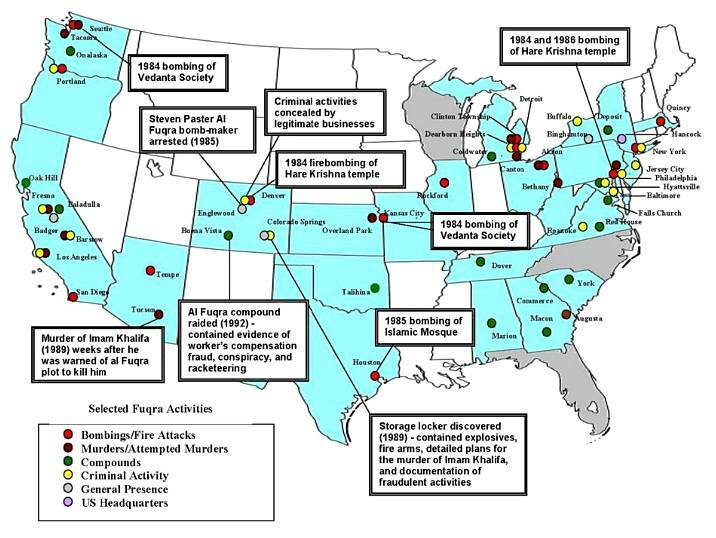 In addition, the only reference I have ever been able to find to a Jamaat ul-Fuqra compound in Falls Church, Virginia, is on the map of JF activity US shown at the bottom of Dr. Williams’ article. A larger version of the same map can be seen here. I’ve had my copy of this map for so long now that I can’t remember where I got it — maybe one of our readers remembers. There is information on this map which I have not been able to corroborate through any other sources, so I haven’t cited it in posts. It’s possible that Dr. Williams is basing his list on the sites shown on the map. I’m not sure that’s a good idea. When we post on these topics, we automatically become members of the Vast Right Wing Hate-Filled Racist Theocon Conspiracy. If any of our assertions are demonstrably wrong, or even factually questionable, the entire enterprise in which we’re engaged can be discredited. So the map is interesting as a tool and a guide for further research, but using it as an authority is not wise. It’s possible that Dr. Williams has other sources for the same information; if so, he doesn’t cite any. But, leaving such nit-picking aside, Paul Williams has written a useful and entertaining account from the belly of the beast.